Senate Minority Leader Chuck Schumer is facing rebuke from a fellow New York Democrat and longtime political ally, for distorting—for electoral gain—the record and policies of the Trump administration. 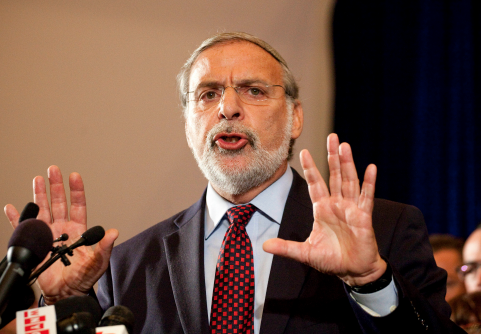 Assemblyman Dov Hikind, who represents Schumer's home borough of Brooklyn in the New York legislature, penned an open letter to the senator after receiving a campaign mailer soliciting financial contributions. Hikind said the mailer attacked the "hard right" while omitting "vital information." In his letter, which was posted on the assemblyman's Facebook page, Hikind castigated Schumer for promising to fight "for Democratic values" while providing little in means of substance. "Senator Schumer, in your letter you promise to fight for Democratic values and go on at great length to fully villainize the current administration, but you left out certain facts that my fellow Democrats, to say nothing of all Americans, should also be aware of," Hikind wrote. "You forgot to tell us about the economy. As good as it’s been, economists expect even more growth through the end of the year. That’s very good news," Hikind wrote. "You forgot to tell us about unemployment, which is lower than it has been in decades, while economic confidence is at a 17-year high." Hikind also expressed support for the tax cuts proposed by the president and enacted by congressional Republicans. "You forgot to tell us about tax cuts. I’m part of the middle class and now I’m getting a little extra in my paycheck," he wrote. "I’m happy about that and so are tens of millions of Americans, Senator." Schumer, who voted against the final tax reform package, has echoed House Minority Leader Nancy Pelosi (D., Calif.) in denouncing the savings, wages hikes, and bonuses made possible by its passage as "crumbs." Hikind represents one of the largest Orthodox Jewish communities outside of Israel and extensively praised the Trump administration's foreign policy initiatives, a number of which were supported by Schumer himself. "You forgot to tell us about the most remarkable relationship between the United States and our ally Israel ever. Or about moving the U.S. embassy to Jerusalem, which you yourself applauded," Hikind wrote. "You forgot to tell us about the successful dismantling of the Iran Deal … [that] threatened the rest of the world by making it easier for Iran, the leading supporter of world terrorism, to develop nuclear weapons." The assemblyman bemoaned the Democratic Party's leftward lurch, which Hikind argues Schumer has helped advance by supporting individuals like Rep. Keith Ellison (D., Minn.) for leadership positions in the party. "You ask for a contribution, but the Democratic Party—which I am a lifelong member of—is currently betraying the ideals that our party once stood for: American values," Hikind wrote. "You yourself proposed that Representative Ellison head the party, but you must surely know that Ellison has stood with our nation’s leading hatemonger Louis Farrakhan." This is not the first time Hikind has been vocal in his repudiations of the Democratic Party and its national leaders. The assemblyman said while President Barack Obama was in the White House that he had surpassed former President Jimmy Carter in being the president who was the worst friend to Israel. During the 2016 presidential election, Hikind asserted the Democrats had abandoned communities like his by moving too far to the left on social issues. Hikind ended his letter by calling on Schumer to stand up and "restore sanity and honesty" to the ranks of the Democratic Party. The assemblyman pledged that until the party moderated itself to re-enter the political mainstream, he would lend his support to Republicans. "Senator Schumer, as a fellow Democrat, I ask you to work to restore sanity and honesty to our party so I can feel good about supporting it fully," the assemblyman wrote. "Until then, I’m afraid the Republicans have my support." This entry was posted in Politics and tagged Chuck Schumer, Democratic Party, Iran Nuclear Deal, New York, Progressive Movement, Senate Democrats, Trump Administration. Bookmark the permalink.